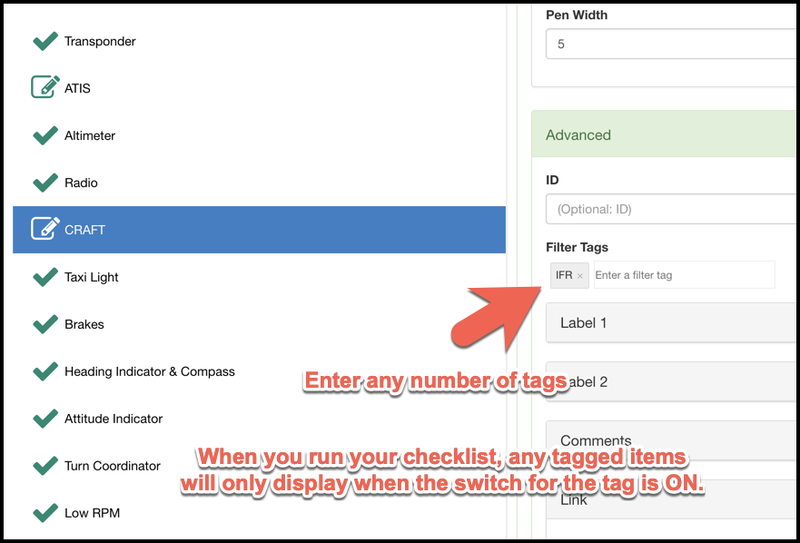 Filter Tags is a feature that allows you to filter your checklist when it is launched. In the editor, under the Advanced section you will see the Filter Tags property. Enter tags such as IFR, or Night. When you tag something you are saying you want the option to hide or show the item when the checklist runs. Items that are not tagged will always show, and many of your items would not be tagged. But if you have specific items you want to display like the CRAFT sketchpad when you are flying IFR, then tag that IFR. When you run your procedure, if there are any tags you will be prompted with a number of switches for each tag. If you don’t want certain items to show turn off the switches.